Update: Note: This website is out of date. Dr. Lee is now concentrating on working with his wife, Dr. Tammy Wu on growing their plastic surgery practice. He isn't doing many hernia surgeries these days. Director and Surgeon who specializes in Hernias: Dr. Calvin Lee, Board Certified General Surgeon. 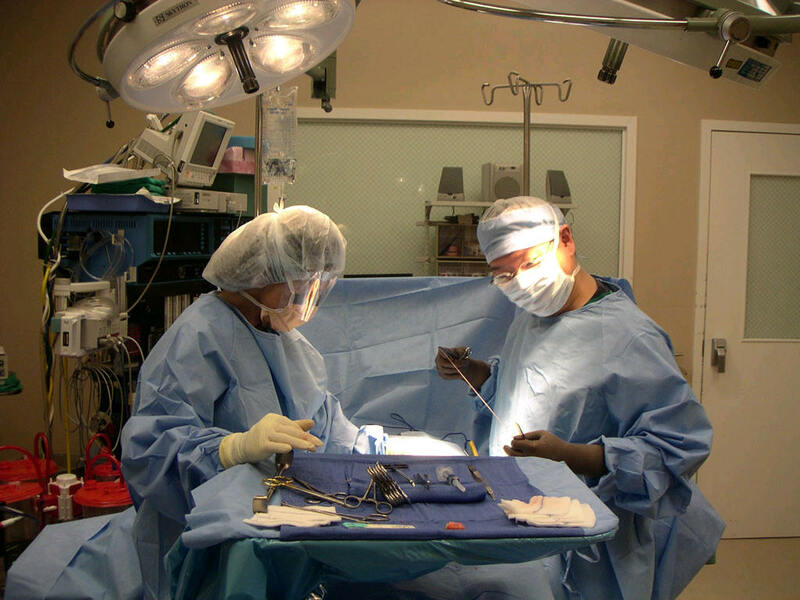 Dr. Lee operating with a surgical assistant. Hernia FAQ web page - information about hernias, mesh, and hernia surgery itself. Getting you back on your feet as soon as possible after hernia surgery. Dr. Lee is a general surgeon who limits his general surgery practice to hernias, gallbladders, breast cancer, and veins. Been in Modesto practicing General Surgery since 2003. Assistant professor for UC Davis - teaching surgery; teacher of the year award 2006. If you have more questions, please write to Calvin Lee, MD directly: calvinlee [at] surgerytoday.com or call us (209)-551-1888. Our office in Modesto, CA. Notice the Modesto Hudson Station post office (grey building with red stripe) to the right of the picture! The parking lot entrance is located between the post office and our building.